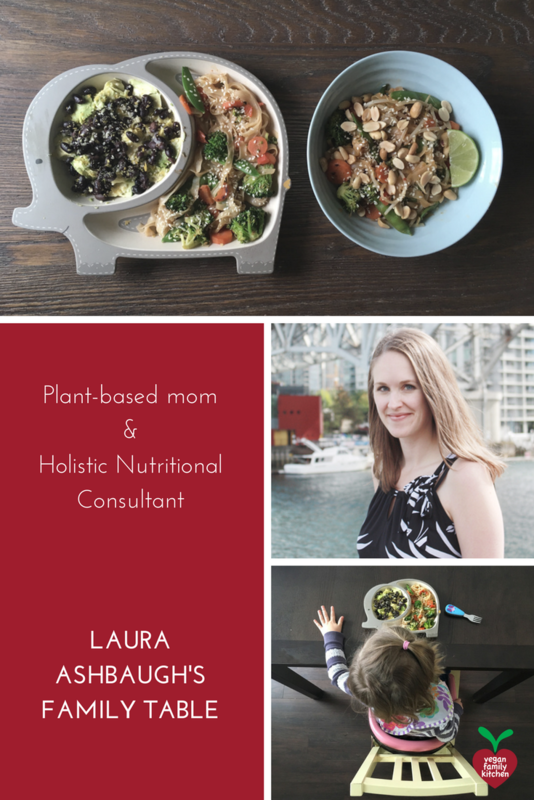 I was thrilled to interview Laura Ashbaugh, a plant-based mom, who advises moms and dads on matters of nutrition. This is the second post in my series on how real-life vegan parents make it work to eat (mostly) whole foods at home. 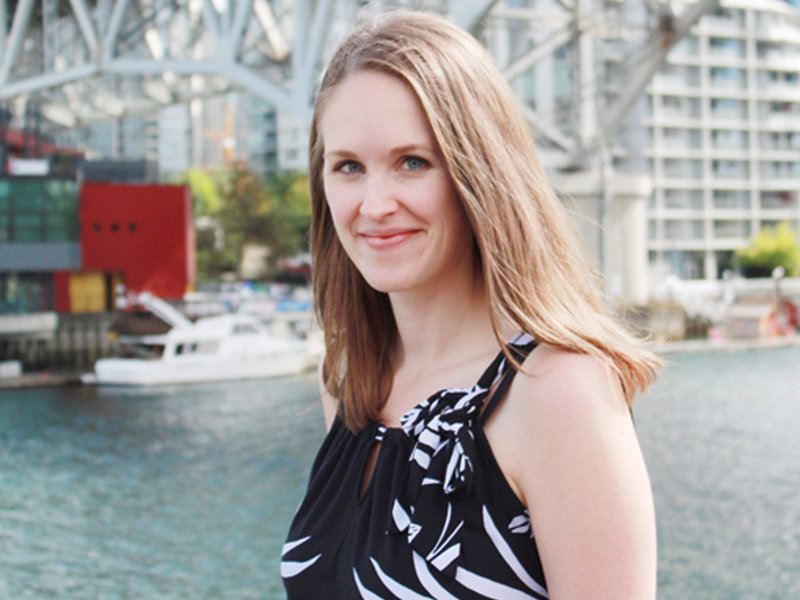 Laura was vegan before having children, and kindly shares some advice for a healthy vegan pregnancy. My family of three eats a completely plant-based (vegan) diet. I’m a plant-based Certified Holistic Nutritional Consultant and my husband is an IT Consultant. We have two and half year old daughter, who has been vegan since conception. Lentil Shepherd’s Pie with a side salad. What kind of food might I find on your dinner table on a normal weeknight? We eat a lot of plant-based comfort foods in the winter (made with whole foods). 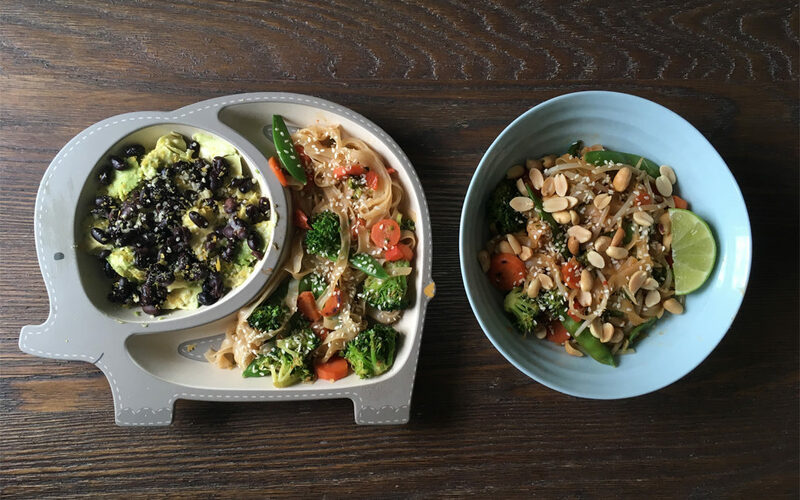 Mac ‘n’ peas, quesadillas and oven fries, tofu stir-fry over quinoa, lentil bolognese over spelt pasta with salad, and Buddha bowls. You were already vegan at the time you were pregnant with your daughter. Do you have any advice for women who are pregnant or trying to conceive while on a plant-based diet? Before trying to conceive, it’s very important to ensure that your vitamin and mineral levels are sufficient, especially if you’ve been on the birth control pill since it depletes the body’s stores of iron, Vitamin C, magnesium, zinc and several B Vitamins (riboflavin, B6, B12, and folate). A simple way to start to increase your vitamin and mineral stores is to begin taking a good quality prenatal vitamin six months before you start trying to conceive – this is in addition to Vitamin B12, Vitamin D3, and DHA/EPA, which are the three supplements that I recommend to my vegan clients since current scientific evidence suggests they are beneficial to those who eat a plant-based diet. It’s also important to increase your intake of fresh fruit, vegetables, dark leafy greens, whole grains, and healthy fats (nuts and seeds) if your diet has been lacking in these nutrient-dense foods. While pregnant, keep including lots of whole, plant foods in your diet. These are the foods that will help your baby thrive and give you the most energy possible throughout your pregnancy. As pregnancy is a time of growth and building, it’s important to ensure that your protein intake is sufficient. Getting the recommended daily intake of protein during pregnancy is definitely achievable by eating plenty of beans and legumes, but you may also like to add some vegan protein powder to a green smoothie every so often for a quick snack. I also suggest that you eat plenty of iron rich foods along with a source of Vitamin C for best absorption – anemia is common in pregnancy, regardless of whether a woman is vegan or not. Oh, and make sure to continue taking a good quality prenatal vitamin and any pregnancy-friendly supplements that you were on pre-pregnancy. 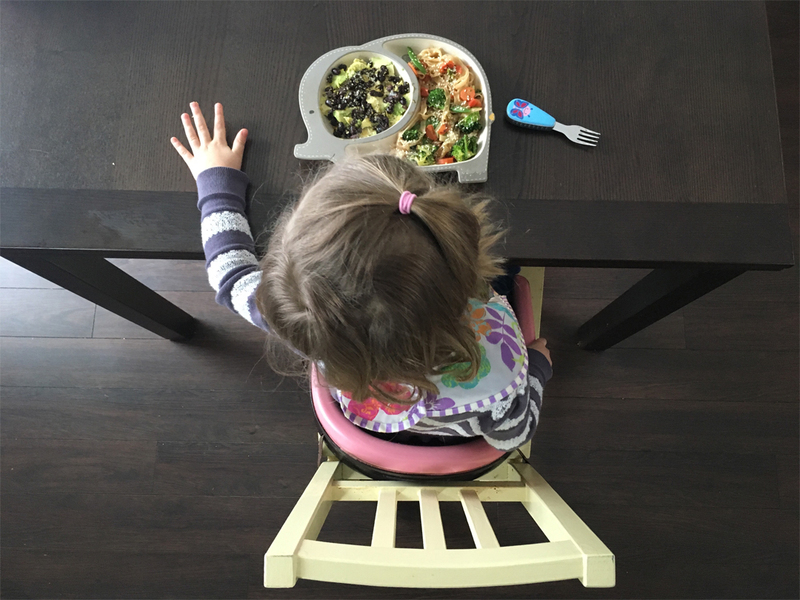 How do you manage the evening meal menu, considering your toddler daughter? Our toddler can be picky, depending on the day and her mood. While I keep her preferences in mind while meal planning, I don’t only make her favorites. I do this for two reasons. First, my husband and I would get sick of eating the same things all the time. Second, children need to be exposed to new foods (or disliked foods) to expand their palates. Even though my toddler doesn’t enjoy it, stir-fry it ends up on her plate every so often, in hopes that she will try it and like it. When I make meals that I know she has not liked in the past, I ensure that there is a side that I know she will enjoy, but I don’t make a separate meal for her. That sounds a lot like what we do in our home! What is your approach to grocery shopping? We keep a list and add to it when our kitchen staples need to be replenished. Then, the day that I go grocery shopping, I create a menu plan for the following week and add the necessary ingredients to my list as I go. I always shop with a list. 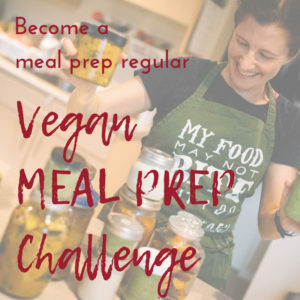 Do you use any strategies to save time when it comes to meal preparation? I batch cook beans and keep them in the freezer. I soak overnight and cook large batches of beans, then drain them and put them on a baking sheet and freeze. Then, after they’re frozen, I put them in freezer bags and use whenever necessary. I love this method because they are so easy to throw into soups, stews, or just to defrost a smaller amount to add to a salad. A colander and hot water work great for this! I also batch cook “refried beans”, which are just pinto beans. I soak them overnight, then simmer in the slow cooker with onion, garlic, chili powder, and cumin. After they’re done cooking, I blend them up with my immersion blender and freeze in one cup portions for quesadillas. How do you manage to avoid food waste? Menu planning! This is key because you only buy what you need for recipes, so there isn’t a lot of extra food in the refrigerator, waiting to go bad. Throwing together a soup or stew with those almost-bad veggies is another way to reduce waste. What about lunches (for adults and kids)? Lunch time is usually leftovers from dinner the night before in our house. My husband and I are lucky enough to work from home most weekdays so we don’t have the stress of packing a lunch. 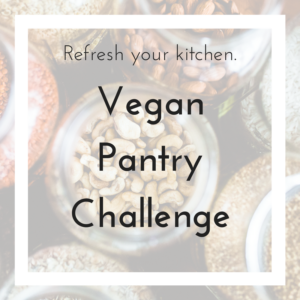 What is your best tip to share with anyone new to vegan cooking and/or to family-cooking? If you’re new to vegan cooking, realize that it takes a while to find your new normal. 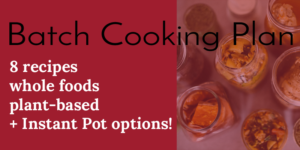 Take the time to research recipes (Pinterest will be your best friend!) and seek out plant-based versions of meals you previously loved. Keep trying new recipes because you never know what amazing veggie burger or mac ‘n’ “cheese” recipe is right around the corner.